The SRWA has gained a good reputation over the years for throwing a GREAT party on the river every now and then. We think this should be one of our best! 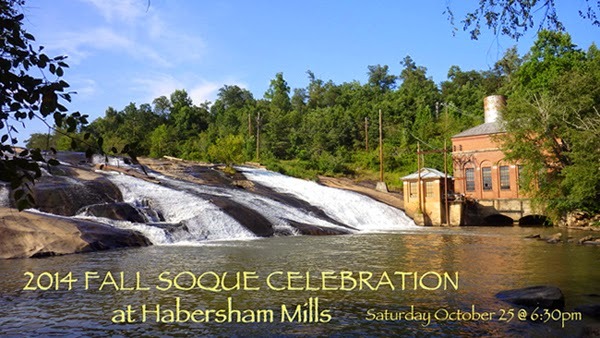 The 2014 FALL SOQUE CELEBRATION on Saturday, October 25th at 6:30pm will be held at the recently restored and revitalized Historic Habersham Mill. The Mill, the shoals and the whole area is one of the most notable landmarks on the River and the recent and beautiful restorations have brought the facility back into splendid use. We're priveleged to be able to showcase this venue! Some of the other highlights of the evening are an EXHIBIT of all of our submissions to the SOQUEE RIVER DAYS project. Excerpts from over 40 submissions of artwork, stories, histories and other EXPERIENCES on the Soque will be on display including works by local artists (most notably many of John Kollock's images of the Soque), and historical photographs. See below for more details. DINNER will be a Carribbean style feast from genuine Carribean chef Gaby Riche! Jerk Chicken, Spicy Pork, rice, cabbage, beans, cornbread and more. Perfect for riverside dining! And no Soque Party is complete without lots of craft beer and wine. Our SILENT AUCTION will feature dozens of items including river-themed local art, pottery, fishing gear, and always some unexpected surprises from Weekend Get-Aways to Medical Procedures!! If YOU have an ITEM you'd like to DONATE, we'd love to feature it in the Silent Auction or our BUCKET RAFFLE which returns this year where $5 gives you a chance to win from a wide array of great items. It's a guaranteed GOOD TIME on the river, for a GOOD CAUSE, with some GOOD PEOPLE. Tickets are $35 per person and are on sale NOW through our online ordering sytem. We're also seeking volunteers for the event, so if you'd like to come for a discounted ticket price and put in a few hours of work let us know by contacting Scarlett Fuller at soque_scarlett@windstream.net. Put it on your calendars, buy your tickets, and come join us for a grand time on the RIVER! The first time I went canoeing on the Soquee, on Memorial Day weekend in 2003, I didn't see a single living soul the entire trip. I did see kingfishers, a beaver family, canada geese, and a rainstorm that made each water drop invert into the sunshine when it plopped in the river. I also went skinny dipping and caught a catfish. At the end I rode my bike back up Pea Ridge Road to Cannon Bridge to complete the sensation of paddling and biking the entire lower section of the river, not to mention that great feeling of self sufficiency. That trip (and others like it) permanently bound my heart to this "one of a kind" river. The Soquee River Days project has been extended through the end of the 2014 to December 31st. With 40 submissions made thus far we LOVE hearing YOUR stories and experiences on the Soque and throughout the watershed. To encourage YOU GOOD FOLKS to continue sharing YOUR Soque stories with us we have added a new twist… weekly prizes donated by local businesses like Hanner’s Outfitters, Copper Pot, Tuckers, Splashe Studio and Java Joes. Each week, our staff and board picks their favorite overall entry to receive a prize and their submission is also published in the Wednesday edition of the Northeast Georgian. If you own a local business and would like to donate a prize we are still looking for a few more weeks to cover through the end of the year. Please email Scarlett Fuller @ soque_scarlett@windstream.net or call 706-754-9382. This simple but powerful memory paints a beautiful picture of what it meant to live off the land here in Northeast Georgia 100 years ago. All Submissions will receive a free SOQUE RIVER MAP. We ask that you come by our office to pick those up. The best submissions will receive a cash prize and print of John Kollock's Soque River Days painting to be awarded at the end of the year. Check it out today and make a submission. At the completion we plan to produce a BOOK that describes how our community experiences the Soque Watershed! Mark your calendars for a River CLEAN-UP on the Soque River, or one of the many tributaries that drain to the Soque in Clarkesville. We'll meet up at PITTS PARK in Clarkesville, and either split into two groups, or after cleaning that area head on over to Rocky Branch which drains everything from the post-office and Ingles all the way down to the Clarkesville Greenway where we just completed our streambank restoration. When we do that part of the clean-up we may also bust up some beaver activity that's been wrecking havoc on that stream as well. And we'll also be right next to the sight of the Clarkesville Greenway expansion into Mary Street Park. We'll start at 9am. Let us know if you can come by sending Duncan an e-mail (dhughes@northgatech.edu). We'll have free t-shirts the day of the event while they last. The City of Clarkesville with the assistance of the SRWA has been taking some giant strides towards incorporating green infrastructure into the city's management for the last several years as evidenced by: a stormwater bioretention feature built in front of North Georgia Floors, a stormwater inventory documenting improvements needed for stormwater infrastructure, and most recently a mini-streambank restoration at the Clarkesville Greenway. Building on these successes the City received a GREEN INFRASTRUCTURE grant from the US EPA earlier this year to help identify 10 priority sites for improving stormwater management by increasing infiltration and treatment and reducing stormwater volumes. The process provides technical assistance in both identifying opportunities for stormwater enhancements, and developing plans, budgets and justifications to aid in future grants to slowly implement improvements all across the city. This type of long-term planning is expected to have a long-term impact in how stormwater and stormwater infrastructure will be built and managed in the future. Part of the process will include looking at ways to tweek and improve policies that will reduce stormwater impacts, and in the process create some aesthetically beautiful viewscapes. The map above identified 10 locations for us to consider as possible first project locations. Priority projects may include anything from removing asphalt and replacing with pervious pavement, to installing bioswales, infiltration ditches, pocket wetlands and other devices that capture, treat, and reduce stormwater runoff. Big thanks to Duncan Hughes, SRWA and Jeremy Pirkle with the City of Clarkesville for getting this grant. Tetra Tech will provide the technical assistance with the project. 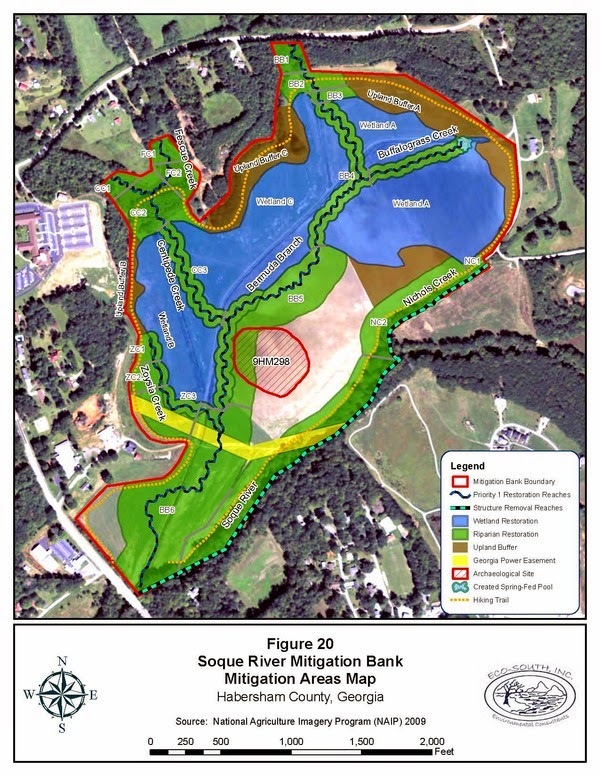 An interesting project got underway last month: conversion of the North Georgia Turf sod farm along the Soque River in Clarkesville (just north of the bridge on 197) into a Mitigation Bank with restored streams, constructed wetlands and other features that should enhance the environmental benefit of the property. Project plans were begun by owners of North Georgia Turf about 3 or more years ago, and now are beginning to be implemented. Mitigation banking is the preservation and restoration of wetlands, streams or other habitats in order to offset or compensate for adverse impacts in nearby ecosystems. The North Georgia Turf property applied to have mitigation credits available several years ago presumably to offset other projects (such as piping a section of stream etc.) in other areas of the Upper Chattahoochee River basin. As developers throughout North Georgia (including the state DOT) are required to have such mitigation offsets when they impact streams, they can purchase mitigation credits which will help to pay for the restoration of this property. Though the details of this project are far too extensive for a short summary, one of the primary benefits of the mitigation program if all goes well is that straightlined drainage ditches on the property will be restored to meandering vegetated streams that should reduce runoff and sediment loads. In addition, the extensive wetlands to be constructed on the property (see map) will work as a sponge during extreme flooding events holding flood waters and reducing downstream impacts including streambank erosion and streambottom scour. The project will take over a year to implement and is being constructed by Northstate, the same contracting firm that helped the SRWA build a natural channel design restoration way back in the summer of 2011. Even though the SRWA isn't directly involved in the project we'll be watching with great interest due to the possible net benefits the project should provide after completion. The proposal also calls for walking trails that could be conjoined with the Clarkesville Greenways trail one day. The owners of the property Soque River Conservation LLC consists of North Georgia Turf owner Aaron McWhorter and former governor (and SOQUE ROAST 2011 special guest) Sonny Perdue. 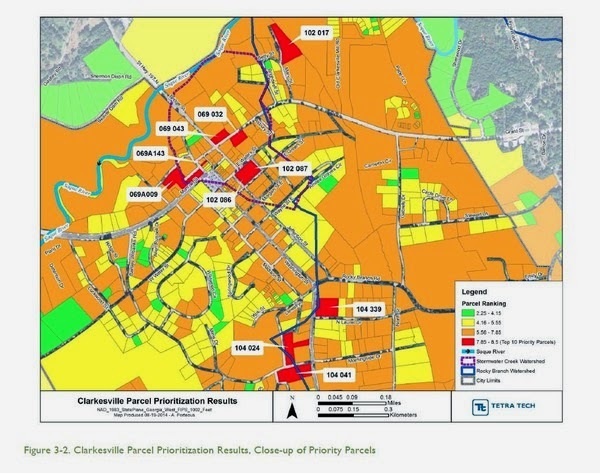 In discussions over the last several years they expressed interest in the properties potential tie ins to a continuous river trail system that one day could connect Clarkesville Elementary to Downtown Clarkesville via a hiking, biking trail along the Soque River. Come on out and enjoy one of Habersham's original run and walk races, and certainly the most scenic. 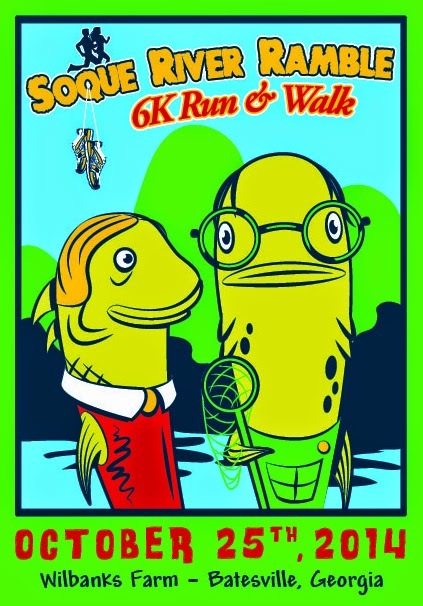 Dale and Jean Holmes are once again hosting this outstanding 6K in the heart of the Soque Headwaters beginning and ending at Marlan Wilbank's farm just down Chimney Mountain Road behind the Batesville General Store. The event benefits the SRWA and our programs to protect and restore the Soque! You'll get to jog right along the river in the pristine headwaters of the Watershed. It's terrific! The pre-registration deadline is OCTOBER 17th. After that registration increases from $20 to $25.